Is it ok if i extend the borders of the PRA to yeh long? Post a valid roleplay reason and you can. Okay, The PRA is full of great industrial lland, but there is little farmland in our nation and our people are going hungry. The lands to the south provide vast fertile plains which we can use to feed our growing populus. Yeah, now time for the Geographer to do his job. As long as you leave our Alledonian colony there alone, we are fine with it. Souran wrote: Yeah, now time for the Geographer to do his job. Wait, before I finish off the map - Is Amon Grungnaz out of the picture? Sir Rian wrote: Wait, before I finish off the map - Is Amon Grungnaz out of the picture? Yes, the owner was a friend of mine and I recieved an email from his wife announcing his death. May I request that Red or Amon Island be dedicated to his honor, and be kept as a sort of sanctuary free from all other nations? That sounds good to me, but it's his call. Alright, I'll put it on the map as Amon Sanctuary then. OOC: I was bored, so I drew the new Abagozen borders. Put them in, if you haven't already. Please change this back we started the war and gained almost nothing of it. Okay, before you add an update, Alledon has claimed Novterra (the continent below) and part of Karmaz, the approximate size of Amon Sanctuary. Germany and Japan both hand a hand in starting World War 2 and they didn't gain anything, actually, they lost big time. Besides, I only divided the land as best I could based on the map of proposed land divisions provided to me by Adineas. 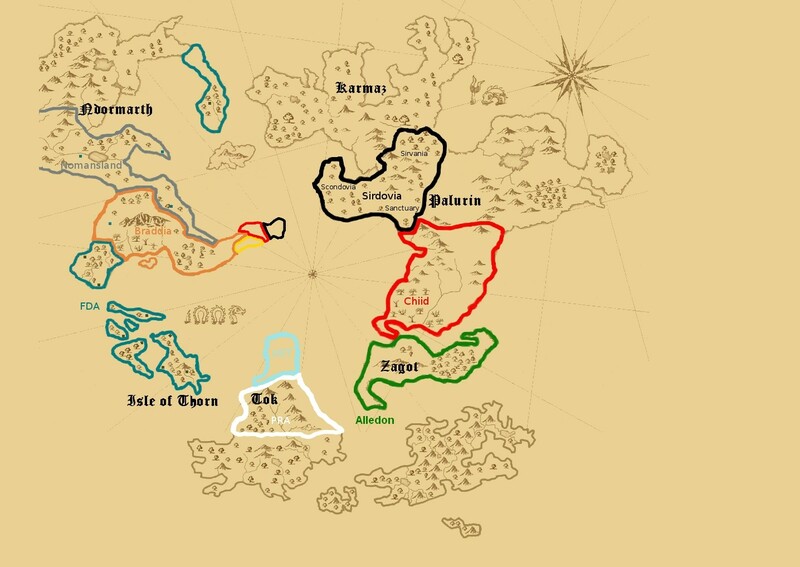 By comparing said divisions map to the map I made, I have concluded that Braddia has ended up with roughly the same amount of land called for in the aforementioned divisions map, and thus if you have an issue I advise you to bring it up with Adineas and/or Souran. 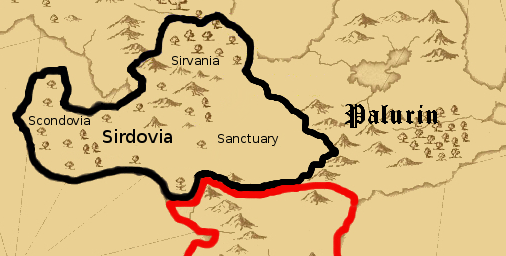 The Divine Imperial Federation of Sirdovia hereby claim sovereignty over central Palurin, A.K.A. Serinia. Serinia is the original homeland of the people of Scondovia, and thus the Divine Imperial Federation claims the land on these grounds. The War Council has heard of your plans to expand and refuses to acknowledge the claims. If you press the claim, military action will take place. I urge you not to so hastily threaten military action, especially in the midst of another war overseas. Though Sirdovia firmly believes in its sovereignty over Serinia, we shall endeavour to settle this dispute diplomatically. The Divine Imperial Federation of Sirdovia proposes that negotiations be held to discuss any grievances other nations have about this claim. Your expansion will greatly undermine our defenses. if war was to ever come between us, we would not be able to secure the wasteland area between the two mountain forts. We would prefer it if your border was near to an easily defendable pass untill we secured peace, but because of certain religious practices, this cannot be so. - Declare war on said nation, and risk invasion through those very defenses anyway. Perhaps Braddia would consider policing a buffer between our borders, preventing military forces from threatening each other. A no-man's land between our borders could provide the security Chiid desires, and the land that Sirdovia wants. If we knew an inavasion was coming we would have time to set up troops but without the knowledge we would be vulnerable. I support the idea of Braddia acting as a buffer.